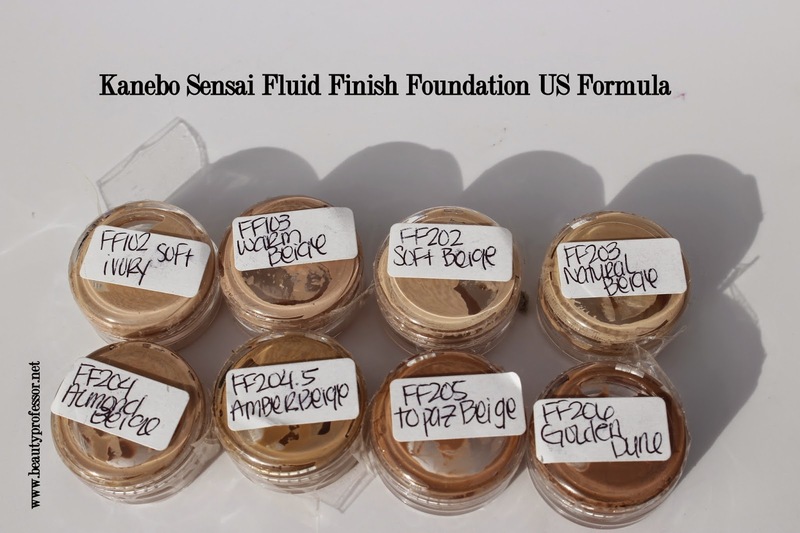 Above: Sample pots of every shade of the Kanebo Sensai Fluid Finish Foundation. With news the illustrious Kanebo Sensai line is leaving the United States at the end of April, many fans of its stellar products (including me, of course) have been stocking up on essentials like the Cellular Performance Cream Foundation (swatched and reviewed HERE, HERE and HERE). 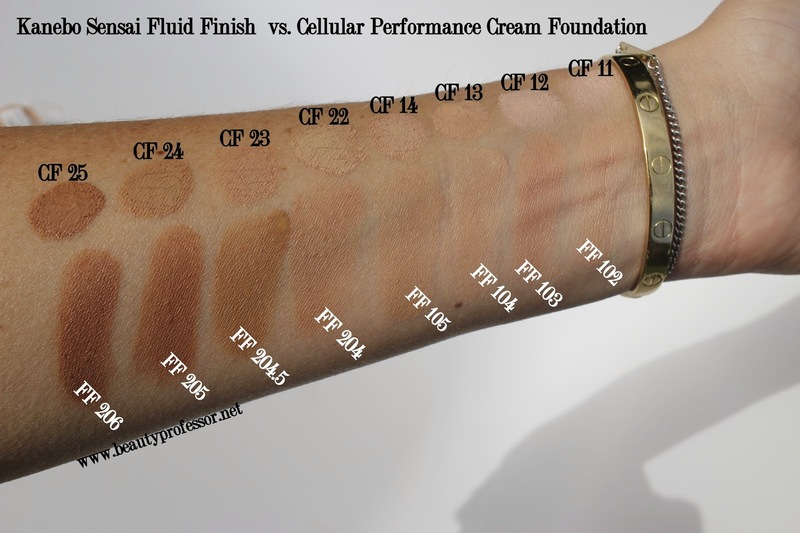 I imagine that most of the products will still be available online (procured from both Asia and Europe) so it made perfect sense to share my swatches of the lovely Fluid Finish Foundation, which, at time of publishing, is still very much in stock at US Kanebo Sensai counters at Neiman Marcus and Bergdorf Goodman. 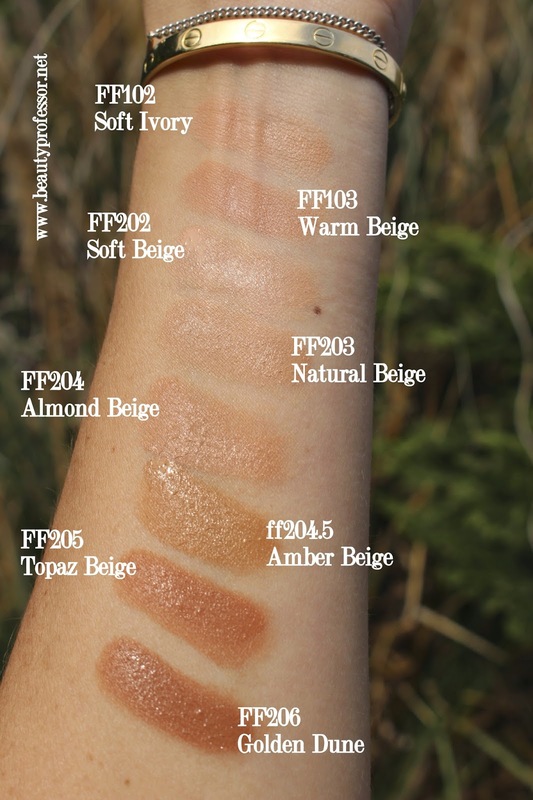 Above: Swatches of the Kanebo Sensai Fluid Finish Foundation in direct sunlight. Deeply moisturizing foundation with 55% water content. The Kanebo Sensai Collection Fluid Finish sheathes the skin in a delicate veil of moisture to provide day-long hydration while imparting a silky, healthy-looking sheen to the surface. Apply sparingly over make-up base after double moisturizing. Due to its fluid texture, I find that this formula offers a bit less opacity than the CP Cream Foundation but one coat is still results in a respectable medium coverage effect. It is light, breathable and plays well with sensitive skin. Additionally, it is an excellent option for summer's warm, humid weather when you want to gently even out your skin tone with a featherlight formula that lasts the day! 1. FF 102-Soft Ivory: Light beige with neutral to warm undertones suitable for N/NC 15-20 skin tones (closest match in the cream is CF 11 & CF 12). 2. 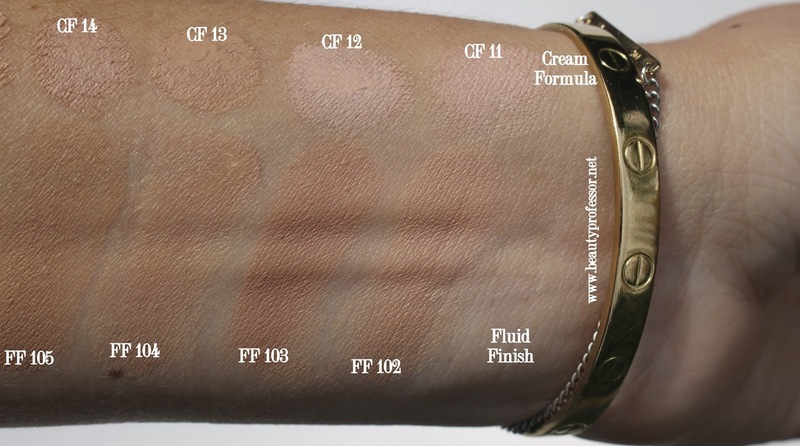 FF 103-Warm Beige: Light beige with rosy undertones suitable for N/NW 20 skin tones (closest match in the cream is CF 13). 3. FF 104-Soft Beige: Light beige with neutral to warm undertones suitable for N/NC 20-25 skin tones (closest match in the cream is CF 22). 4. 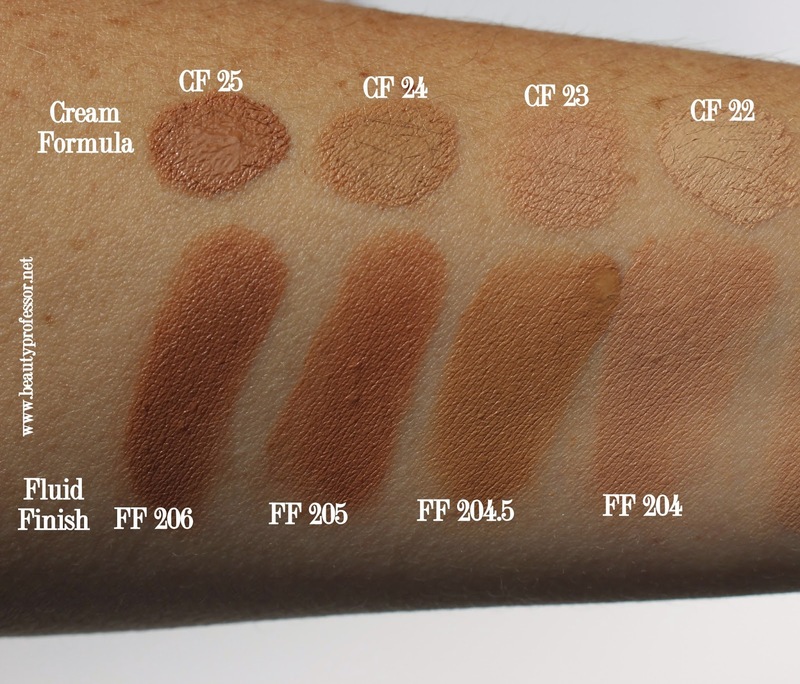 FF 105-Natural Beige: Light to light-medium beige with neutral to warm undertones suitable for N/NC 25-27 skin tones (closest match in the cream is CF 14). 5. FF 204-Almond Beige: Medium beige with neutral to warm undertones suitable for N/NW/NC 30-33 skin tones (closest match in the cream is CF 23). 6. FF 204.5-Amber Beige: Medium to medium-dark beige with warm undertones suitable for N/NW 35-42 (closest match in the cream is CF 24). 7. FF 205-Topaz Beige: Dark beige with neutral to warm undertones suitable for N/NW/NC 42-50 skin tones (closest match in the cream is CF 25). 8. FF 206-Golden Dune: Darkest beige with neutral to warm undertones suitable for N/NW/NC 50+ skin tones (closest match in the cream is CF 25). 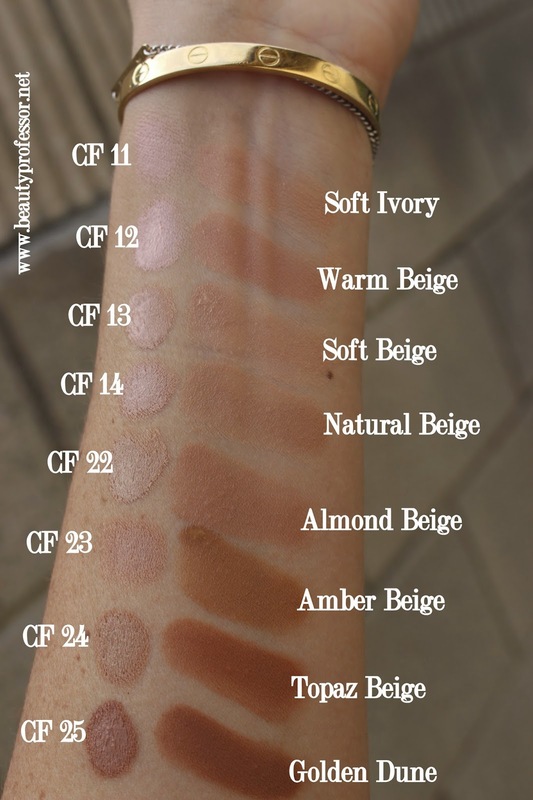 **I find that there is not direct correlation between the eight shades in both formulas; in fact, the cream formula shades run slightly lighter overall! 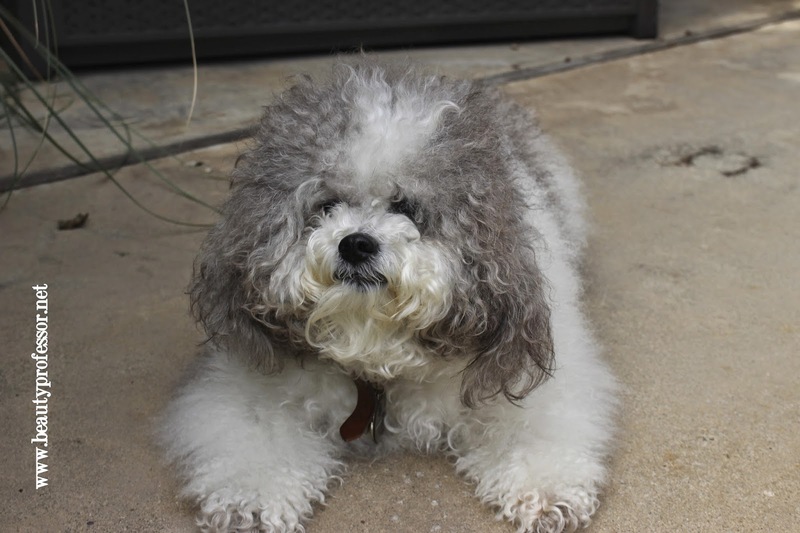 Above: Whenever I take pictures outside, the ever-curious Jethro likes to get in on the action! Above: BP and Kimmie at the Kanebo Sensai counter at Neiman Marcus Fashion Island...I was stocking up on backups of my favorites from the line! I hope these swatches are useful to you both now and in the future when ordering online both in America and internationally! I had no idea Kanebo is leaving the US. How terrible! I know I can order it off of Selfridges, since they deliver to the US, but it's another $25. And I actually enjoyed the new US formulation much more, given that it didn't have SPF. I prefer to wear my SPF with my moisturizer, rather than have it in my foundation. I just ordered two refills of the CP cream foundation. xoxo and hope your week is going well, Shoshana! Gee, this is sad. The cream foundation is amazing and mascara and so on. I guess I will need to stock up too. I totally agree...it's such a loss to our beauty market. I wish you the best in stocking up! Why are they leaving US? Now that makes me sad. Thanks for the tip! I am told that the company was recently sold and the new owners want to focus on Asian and European markets only. Such a bummer! I as well will be ordering both nat. Beige & almond beige. My winter/summer shades! So sad. Love dealing with Kimmie. She's wonderful! Excellent, Lynn...Kimmie is such a treasure and I am waiting to hear where she lands next. Hopefully we'll continue to get to work together! Darn! I put off buying the cream foundation, and now the shades that might have worked for me are all sold out, locally and online. With a price tag that high, it's too risky ordering from other online websites without being able to test/return the product. Truly sad! I would choose the CP Cream, Anon...I prefer it to the liquid! I would recommend the Sensai Foundation Powder...great coverage and lasting power! Thank you so much for answering me! I've now bought CP cream and triple compact powder. I tryed them both at a friends house when I stayed there for a week. My skin has neverrr likes better! i smiler everything I looked in the mirror and I was thrilled about how good it covers mu pores. She had a shade called "bamby beige", wich gave great glow, but was a bit too tan for me. I bought "soft beige" and 02 medium in the powder. It was a huge disapointment. Looks so cakey and does not looks half as good as the products I used at my friends house. Buy whyyy? :( I don't understand! Could it be that I didn't buy the same shade? My pleasure and I am not sure why you didn't get the same result at home with your shade...perhaps there was a change in weather? So glad you figured it out!